England… Middle Ages... suiting up with the proper riding gear takes 30 minutes and a small team of valets to assist you in the process. Your gear is heavy, your fitment is cumbersome, and your mode of transportation is, well… 1 horsepower. Fortunately for us the times have changed. Gear has now become a vast and ever expanding realm of technological improvements with constant innovation geared towards simplicity and ease of use. We have new materials, new designs, and new concepts of ergonomic protection against the potential hindrances to the enjoyment and safety of our daily commute. Firstgear is a company that is leading the way in this regard. Their credo of “Any weather, any condition, any time” rings true in their products and stands at the forefront of their line. Looking ahead at the re-designed for 2014 HT Overpants, the focus on innovative gear for the ardent motorcycle enthusiast can be seen on full display. The Firstgear HT Overpants & the Firstgear Women's HT Overpants are built for riders seeking to maximize their experiences through the circumstances that they may encounter in the cooler riding conditions of the Fall, Winter, and Spring months. The always-waterproof HT Overpants have the membrane built into the shell itself and come with a removable thermal liner for those times of the year when the temperatures are slightly less hospitable. While the liner is installed, you have built-in pockets that can be reached through the outer shell. When the thermal liner is removed, however, you have the increased functionality of through-pockets which will allow you to reach your interior garments and access whatever gear or valuables that you may be carrying. Specifically looking at the changes made for the 2014 line, the largest difference is evidenced in the attention to fitment details. This can be seen in the extended side zippers of the Firstgear HT which will now rise to the mid-thigh area and allow for an easier on/off aspect of the outer shell. At the same time, in not being full-zip pants, they create a more comfortable fitment for the rider. With a wider opening at the bottom in comparison to the previous edition of the HT Overpants, riders will be better able to quickly, efficiently, and comfortably gear up for the ride… no valets necessary! In addition the outer shell construction will now utilize 420-denier nylon Hypertex material for lightweight, durable, all-weather protection from the elements. 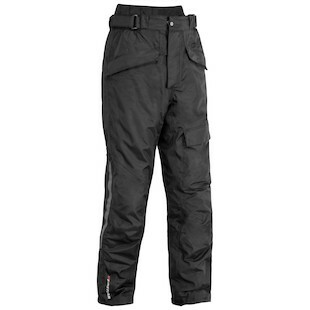 When combined with features such as silicone gripped and elasticized internal storm cuffs, as well as the rubberized YKK thigh vent zippers and articulated knees with adjustable CE armor, the outer shell of the HT Overpants provides a burly defense against meteorological unpleasantries while also protecting riders in the event of a fall. So as the weather begins to turn and the welcoming hospitality of summer slightly wanes with the changing of the seasons, remember the Firstgear line of outerwear and the HT Overpants as you saddle your gallant, octane-driven steed and ride nobly in search of new adventures.